Knowing how much the support of Olusegun Obasanjo helped the APC and Muhammadu Buhari to defeat Goodluck Jonathan in the 2015 presidential election, the ruling APC is said to be in panic over Obasanjo's open support for PDP's Atiku Abubakar for 2019. 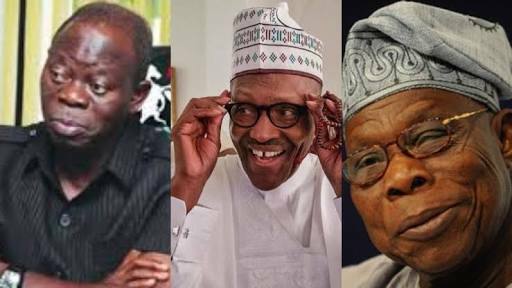 APC national chairman Adams Oshiomole has cried out, saying Any attempt by Obasanjo to return to power by proxy will be resisted. He dismissed Obasanjo's statement that the PDP will unseat the APC-led administration from Aso Rock, come 2019 general elections. Oshiomhole spoke in Kano where he led other APC stalwarts to receive hundreds of members of the PDP and the Kwankwasiyya Movement, who defected into the ruling party at the Sani Abacha Stadium. ”Obasanjo’s dream to rule Nigeria by proxy will not succeed,” Oshiomhole said. He said: “It is a wonderful day that all the progressives have come together to reinforce power to sustain our democracy. Never again should this country be governed by opportunists. “President Muhammadu Buhari’s constituency is the army of the poor. We are building a country where those who work will be able to eat, not those who use telephones to make billions without working for it. “We are waiting for the message and shall respond appropriately to their message. This country must move forward. It does not belong to those who have a history of taking so much out of the system even as they cannot show what they have put into the system. “We have to fix all the problems; we did not come in to fix them overnight. What they did not do in 16 years cannot possibly be fixed in three and half years. But I believe we have shown the most important quality that we need in a leader – to have a man of honour, a man of integrity, a man that you can trust; and that is President Muhammadu Buhari. Oshiomhole replied to criticism by the PDP of the electoral process. He said: “Let me also use this opportunity to appeal to our opponents in PDP that they seem to be crying before the election takes place. When they win, everything is perfect; any time they lose, nothing is right. I see them writing a letter to the United Nations (UN) and I’m asking who is going to carry the letter. “Nigerians will not forget that it was PDP under President Olusegun Obasanjo who introduced what he called do-or-die politics. They remember when he said the election of 2007 was a do-or-die for him. “Fortunately, we did not die; fortunately, he is still alive. He would be alive to see a country that grows from strength to strength, that is detained by the bitterness of the past.